I spent most of an evening this weekend making this duck pasta. There are many dishes for duck ragù and while I can’t promise that this is ultimate version of the dish, what I did end up making was very satisfying. The amount of fresh thyme and orange might seem a bit much, but you need them to balance the richness of the duck. You can vary this sauce as you like–omit chillies, add more tomatoes, red wine, your own mix of spices or herbs, use a whole roast duck. I think this is best served with short or long pasta that can catch all of the sauce, so nothing too thin or little, but it’s up to you. 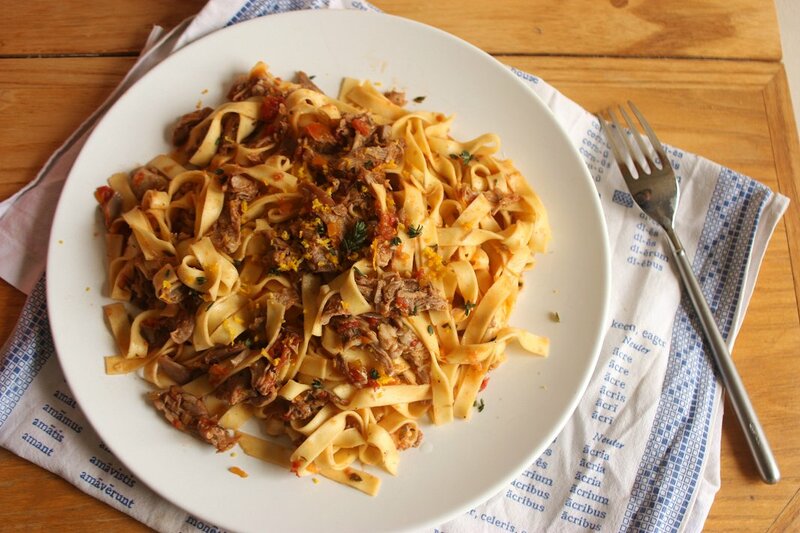 This isn’t by any definition a quick supper as it needs long, slow cooking, so you can relax while it quietly simmers away on the stove, and know that you have easy meals ahead of you if you’ve any leftover sauce. I certainly enjoyed it when it was sleeting yesterday. Leftover sauce keeps for 3 days in the fridge. Set a large heavy-bottomed pot over a medium-high heat. Lower the duck legs skin-side down into the pot, fitting them in snugly and letting them sear and crisp for a good 7 – 8 minutes until deep gold. Turn over and let the other side brown for a few more minutes, then remove the duck legs to a plate. Lower the heat to medium-low and add the shallots, garlic, celery, and carrot to the duck fat. Cook, stirring, until the vegetables are beginning to soften. Add the dried chillies, thyme leaves, and bay leaf. Pour over the canned tomatoes and about 250ml chicken stock, bringing everything to the boil. Add the duck legs back to the pan, pushing them into the liquid to make sure they’re mostly submerged, adding more stock as necessary. Cover and let it gently simmer for 1 1/2 – 2 hours until the duck legs are very tender and easily pierced right through with a fork. Check on it occasionally, topping up with stock if needed. Lift the duck legs out of the pot to a chopping board. When it’s just cool enough to handle, remove the skin and shred the meat into large pieces. I keep the bones and let them simmer with the sauce, removing them upon serving, but you can discard them immediately or wash and keep them for another stock. Return the duck meat to the pot and let it simmer, half-covered, for at least 30 minutes. If the sauce is much too fatty for your taste, scoop some of it off, leaving a little to marble the surface. If it’s too thin, let it boil uncovered until it thickens; conversely, you might want to loosen it with a bit of stock or water. It shouldn’t be a dry, puree-like sauce, but more of a thick stew that will lightly coat the pasta. Add the orange zest and juice to the sauce. Mix well and season with salt and pepper to taste. Be generous with the salt. Set the sauce aside while you cook the pasta. Bring a large, full pan of well-salted water to a rolling boil. Add the pasta all at once. Cook, stirring, timing it for about 3/4 of the stated packet time; taste-test a small piece to check how it’s coming along. When the pasta is just a touch firmer than you’d ordinarily eat it, immediately drain it and toss with the duck sauce. You want to thoroughly coat each strand. Serve right away.